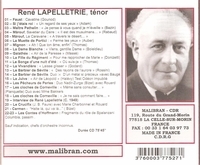 “Lapelletrie débuted in 1908 at the Théâtre Trianon-Lyrique in Paris and then sang from 1909-11 at the opera house of Dijon, in the 1911-12 season at the opera house of Nice, from 1912-14 at the opera theatre of Marseille. From 1911 he was singing almost annually at the opera theatre of Vichy, where he was a star during 1920s. In 1914 he was engaged by the opera house of Champs-Élysées in Paris where he had a sensational success in Berlioz’s BENVENUTO CELLINI. From 1919 he was to be heard at the Opéra-Comique and at the Théâtre Gaîté-Lyrique in Paris. He débuted in 1919 at the Opéra-Comique as Werther and remained there till 1928. He sang at the Opéra-Comique and appeared in the premieres of Moret’s LORENZACCIO (1920), LE SAUTERIOT of Silvio Lazzari (1920) and Bachelet’s QUAND LA CLOCHE SONNERA (1922). In 1928 he guested in Vienna, and in 1931 with the ensemble of the Opéra-Comique, he appeared at the opera house of Cologne as José in CARMEN. In 1928 and 1929 he performed in Amsterdam as José; otherwise, however, he appeared a little outside France as a guest, while he guested at the opera houses of Marseille, Nice, Toulouse and Montpellier. After the second world war he appeared again at the Paris Opéra-Comique, now in Buffo roles, and until 1950 in comprimario parts. Then he lived as a pedagogue in Bordeaux, where from 1941 worked at the conservatory."